Explore New Bern’s rich and diverse history by viewing our many historical markers located throughout the historical districts and in neighboring James City. With over 1500 historical markers throughout the Tar Heel State, North Carolina’s Historical Marker Program is one of the oldest such programs in continuous operation in the United States. The house has connections to both sides of the Civil War. Confederate General Lewis A. Armistead was born in the house in 1819. While Union forces occupied New Bern, General Ambrose E. Burnside used the house as his military headquarters. From 1935 until 1965, the Stanly House served as New Bern’s public library, and was moved to its current location near Tryon Palace in 1966. It was opened to the public as a historic house museum in 1972. John Wright Stanly was buried in an unmarked grave in Christ Episcopal Church in New Bern, as were his wife and son. The printing press, with its potential for increasing the speed of transmission of the written word, was somewhat slow in reaching the province of North Carolina. The establishment of a press in the state capital of New Bern was due in large part to the actions of governor Gabriel Johnston and printer James Davis. The first printing press enabled North Carolina to publish uniform law codes and allowed citizens to distribute information at a speed that was otherwise impossible. 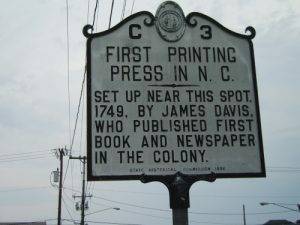 Although printers had been active in some colonies for over 100 years, North Carolina became the ninth colony to acquire a public printer in 1747. It was not until the grievances of governor Gabriel Johnston in 1736 that North Carolina’s General Assembly voted to begin the process of hiring a printer and press. North Carolina had been slow to acquire such technology for several reasons. The provincial government, having grown accustomed to North Carolina’s slow communication lines, was afraid of the challenges to their authority which the printed word presented. In addition, since North Carolina’s economy was based on agriculture, the rural colony did not possess the dense populations that other cities relied on to finance an investment such as a printing press. Lastly, as there had been facilities at Virginia and Charleston since 1737, those in North Carolina found it easy to send print requests out outside the colony. In 1734 Gabriel Johnston complained to the General Assembly that he was unable to find a complete copy of the 1715 public laws anywhere in the state, and that most counties had erroneous copies if any at all. This prompted the Assembly to approve a public printer for North Carolina, and in 1747, Johnston appointed James Davis (1721–1785), a printer trained by William Parks of Williamsburg, Virginia. Although Davis’ first task was likely the printing of currency, in 1749 he printed the first official publication, the Journal of the House of Burgesses of the Province of North Carolina. Davis went on to serve as public printer until 1782, with the exception of a five-year hiatus. James Davis also created and sustained the colony’s first newspaper, the North-Carolina Gazette, from 1751 until his death in 1785. At the start of the American Revolution, Davis allowed anti-British sentiment free reign over the opinion columns of the Gazette. Although he was appointed to various political positions during his life, James Davis is best remembered for publishing the first newspaper and imprint in North Carolina. Abner Nash (ca. 1740-1786) succeeded Richard Caswell to become the second governor of the young state. He was born in present-day Prince Edward (then Amelia) County, Virginia. Of Welsh extraction, he was the son of John Nash and the former Ann Owen. Though little is known of his educational background, he began the practice of law in 1757 and, in 1761-1762, represented Prince Edward County in the House of Burgesses. Nash was first married to Justina Davis Dobbs, the widow of Governor Arthur Dobbs. His second marriage was to Mary Whiting Jones of Chowan County. Soon after leaving the Virginia legislature, Nash moved to North Carolina, residing briefly in Hillsborough and Halifax. Experiencing success in both law and politics, he represented the town of Halifax and Halifax County in the North Carolina assembly in 1764-1765 and 1771, respectively. In the early 1770s Nash relocated to New Bern, the seat of royal government, where his professional and public careers prospered. Moreover, as tensions with Great Britain mounted, Nash distinguished himself as a leading and zealous advocate for the Patriot cause. Indeed, when Governor Josiah Martin fled from New Bern for his own safety, he singled out defiant Nash for special censure. From 1774 to 1776 Nash was a delegate to each of North Carolina’s five provincial congresses, while also serving as a member of the Provincial Council. In 1777 he represented New Bern in North Carolina’s first General Assembly as an independent state, serving as speaker of the House of Commons. During the two following years, he remained in the lower house of the legislature as a representative of Craven County. In 1779 and 1780 Nash sat for neighboring Jones County in the state Senate, serving briefly as speaker. On April 20, 1780, he resigned his seat upon his election as governor. In August 1780 the disastrous defeat of Patriot forces at Camden rendered circumstances still more desperate, for North Carolina now lay open to invasion by Cornwallis’ army. Eventually, the tide of war began to turn following the battles of King’s Mountain and Guilford Courthouse, but the exhausted and frustrated Nash had no desire to serve longer in a position he considered untenable. When nominated for reelection in June of 1781, he cited “excessive Fatigues” and “want of health” in asking that his name be withdrawn from consideration. Once the settlers arrived, they realized there had no protection against the Tuscarora Indians, who were fiercely protective of their land and felt the settlers were invading their territory. Many of the Swiss settlers were massacred. The Indians captured Graffenried and Lawson. Graffenreid was released but Lawson was burned at the stake. Once Graffenried was returned by the Indians, he traveled to Virginia to ask the Governor for military aid against the Tuscarora Indians. After failing to receive help and realizing he was out of money, he decided to go back to Switzerland where he spent the rest of his life. The Battle of New Bern on March 14, 1862, was the second of three major engagements on the North Carolina coast in the second year of the Civil War. On February 7-8, Union troops under General Ambrose Burnside captured Roanoke Island, thereby securing control of the sound region. In March, those same forces captured New Bern, a strategic port town and the state’s second largest city. On April 8, Burnside’s expedition laid siege to Fort Macon and two weeks later took the stronghold. With it they gained another deepwater port at Beaufort and control of the entire northern and central portion of the state’s coast. Only the Cape Fear, the “lifeline of the Confederacy,” remained open to use by blockade runner through January 1865. They anchored at the mouth of Slocum’s Creek and, early on the morning on March 13, shelled the shoreline and disembarked. No Confederates were posted there but signals upriver set bonfires to announce the Federals’ approach. The troops marched overland about two miles to reach the Beaufort-New Bern road. One soldier wrote of the “muddiest mud ever invented, being knee-deep and of a black, unctuous, slippery character.” Burnside’s army pressed on, a total of thirteen miles, to New Bern. The next day, March 14, the town fell to the Union soldiers and remained occupied for the rest of the war. Fort Totten was built on the western edge of New Bern in 1862, after occupation of the city by Union forces and prior to the Battle of New Bern. The military installation was named for Joseph Gilbert Totten, a Union general born in New Haven, Connecticut, in 1788. Totten played an active role in the War of 1812, the Mexican-American War, and the Civil War. By March 1863 he had been promoted to brigadier general in the regular army. In order to honor Totten for his sixty-two years of service, he was awarded with a brevet promotion to major general by the War Department before he died in April 1864. The Union mounted the campaign to gain control of New Bern because it would help them gain control of North Carolina’s sounds, coast, and the Neuse River. The strategy gave the Union a strong base to launch further attacks into the state. The plan proved successful and the Union held control of the sounds and coast until the end of the War. Four artillery companies with a total of 251 enlisted men were stationed at Fort Totten. Five companies of infantry on provost-guard duty were stationed in the rear of Fort Totten with a total of 454 men. The armament included four thirty-two pound howitzers, two thirty-two pound rifles, nine thirty-two pound carronades, one eight inch columbiad, and two eight inch mortars. The fort had lines of entrenchments that were extended on either side leading to the Neuse and Trent Rivers. Today Fort Totten is a family park that is on a five and one-half acre site. The park includes a lighted softball field, playground set, several picnic shelters, grills, picnic tables, restroom facilities and a small parking lot. George Edmund Badger, a native of Craven County, served in state and national office during his career, including a stint as Secretary of the Navy in 1841. He was as a U.S. Senator between 1846 and 1855, a North Carolina Superior Court Justice, and a representative in the Secession Congress in 1861. Badger is remembered for his staunch nationalism. Following his retirement from the Senate in 1855, Badger returned to his home in Raleigh where he served as county magistrate and practiced law until his death in 1866. Bayard v. Singleton, a landmark North Carolina court case that set a precedent for the exercise of judicial review, was decided in New Bern in November 1787. In that year, Elizabeth Cornell Bayard filed suit to reclaim lands and property of her father, Samuel Cornell, which had been confiscated at the close of the American Revolution because of Cornell’s loyalist sympathies. The property had been purchased in 1784 for £2,160 by New Bern merchant Spyers Singleton. The court’s acknowledgement that legislatures could not make laws that violated state constitutions, and the case’s eventual decision, angered many on both sides of the argument. Richard Dobbs Spaight, a signer of the Constitution, denied openly in the press that the courts had any right to deem a legislative action unconstitutional. Nevertheless, the Bayard v. Singleton opinion of the court was widely published and distributed to attorneys, setting a precedent for judicial review within the American legal system. Fort Point in Craven County was the site of a small fort built in 1775-1776 by Whig forces guarding the river approaches to New Bern. The facility was named Fort Caswell in honor of Governor Richard Caswell but never saw action during the war. The Americans dismantled and removed the guns of the earthwork fort prior to the British capture of the town in August 1781. During the Civil War, local Confederate officials rebuilt and expanded the fort, renaming it Fort Lane. The small defensive position boasted between three and eight guns at different times, and served as part of New Bern’s defensive network along with Fort Thompson and Fort Ellis. Several North Carolina Confederate regiments served brief tenures at the fort. John A. Graham, a young officer in the 27th North Carolina wrote a poignant letter to his father William A. Graham on March 7, 1862, in which he noted, “Our men are living in tents, but seem to like this place better than Fort Macon.” Graham’s unit had originally been posted at Fort Macon near Morehead City. When New Bern fell to Union forces a week after Graham’s letter, Fort Lane was destroyed and its guns dismantled. Union forces never reused the defensive position, instead focusing their efforts on the construction of Fort Totten. During the American Revolution, even prior to France’s formal entry into the war, hundreds of French soldiers of fortune offered their services to the United States. One such individual was a dashing young nobleman, Charles-Francois Sevelinges, who claimed the title Marquis de Bretigny. In the spring of 1777 he began writing petitions to Benjamin Franklin, offering his services along with that of ten of his closest comrades. A captain in the French Army who served in the Guards regiment of the brother of King Louis XVI, Bretigny was born in Soissons in 1758. His offer of service was accepted, but the vessel in which he embarked for America was captured in the West Indies. Imprisoned for a short time in St. Augustine, Bretigny eventually obtained his freedom, and began offering his services to the Continental army, writing several letters to George Washington and the Continental Congress. He evidently had befriended John Laurens, son of South Carolina political elite Henry Laurens, as Bretigny’s proposal to raise a French regiment was written in Laurens’s hand. Discouraged in his efforts to raise a French regiment for Continental service, de Bretigny was much more successful in convincing the government of South Carolina to let him do so. In September 1779, de Bretigny’s letters to the Comte de Estaing convinced the commander of French forces in America that Savannah was ripe for the taking. In response, de Estaing, united with an American force led by Maj. Gen. Benjamin Lincoln, launched a poorly-managed and unsuccessful assault on the city in October. After the fiasco at Savannah, de Bretigny took command of an ad hoc regiment of South Carolina militia composed of French and American sailors and citizens of Charleston. He led his regiment in the siege of Charleston, but somehow managed to escape captivity when the city fell in May 1780. Having had little luck in Georgia and South Carolina, de Bretginy turned to their northern neighbor, where he obtained a commission in the North Carolina militia. De Bretigny briefly commanded North Carolina militia cavalry, and led a company in the Battle of Guilford Courthouse. Afterwards he was appointed North Carolina’s intermediary between the state and the French government. De Bretigny operated out of the island of Martinique, and helped organize financial transactions between the two governments as well as shipments of military material and goods. At the war’s conclusion De Bretigny retired from public service in New Bern. He apparently lost his entire fortune during the French Revolution, and died in poverty in Philadelphia on June 27, 1793. Born near Pollocksville in Jones County on land where his family had lived since the early 1700s, Simmons graduated from Trinity College in 1873, at which point he moved first to Goldsboro and then to New Bern to commence the practice of law. In 1908 he purchased an imposing house on Front Street in New Bern, where he lived until his death. The municipal airport in New Bern is named in honor of the Senator and of young pilot Benjamin Nott, killed in a crash in 1931. In Wilmington, on July 21, 1774, William Hooper convened a meeting of colonists from the Cape Fear region who felt that it was “highly expedient” that a Provincial Congress be held separate from North Carolina’s royal government. Invitations to send delegates were dispatched and, in response, thirty counties and four towns held elections without delay. Although the congress was initially planned to convene at the Johnston County Courthouse on August 25, the provincial leaders moved the meeting place to New Bern. Thus, the rebellious First Provincial Congress was held virtually at the feet of the royal Governor, Josiah Martin. No attempt was made to stop the assembly. On August 25, 1774, seventy-one delegates were present at roll call for the first provincial congress held in any of the colonies. John Harvey of Perquimans County, who had been serving as Speaker of the Lower House, was unanimously elected moderator for the landmark session. The congress, which lasted only three days, rallied support for the people of Massachusetts and endorsed the proposal that the colonies hold a Continental Congress. To that end, the Provincial Congress selected William Hooper, Joseph Hewes, and Richard Caswell as delegates to such a convention. Aside from the revolutionary topics, the delegates to the First Provincial Congress also discussed basic rights and responsibilities of government. They were eager to exercise control over North Carolina’s affairs. The concluding pledge to support the actions of the forthcoming Continental Congress was testament to their goal of self-government and to their preparedness to achieve that goal. George Henry White was the fourth of four African Americans to represent North Carolina’s Second District in the United States House of Representatives in the nineteenth century. He was born near Rosindale in Bladen County on December 18, 1852. His father was Wiley F. White and Mary White is the woman that George considered his mother. The highway historical marker for White approved in 1976 indicates that he was born into slavery, as was believed at that time. However, Benjamin R. Justesen’s 2001 biography of White relates details that tend to refute the statement. George H. White was raised as a free black, as was his father Wiley. However there is some indication that George, like his older brother John may have been born to a slave woman that Wiley White never married. If that is the case, Wiley and Mary White would have had to purchase the boys. Regardless of his circumstances of birth, George White attended public schools and studied under D. P. Allen, president of the Whiten Normal School in Lumberton. White graduated from Howard University in 1877. He initially held principalships at two New Bern schools, while at the same time studying law under Judge William J. Clarke. White obtained his license to practice law in North Carolina in 1879. George H. White launched his political career in 1881, when he was elected from Craven to serve in the North Carolina House of Representatives. In 1885 he served in the State Senate. The following year White was elected to a four-year term as district solicitor for the Second Judicial District. White moved to Tarboro in order to be eligible to run for office in what was known as the “Black Second” Congressional District. The district had a significant black population and three times had elected African-Americans to Congress. White was elected to Congress in 1896 and 1898. At the time, he was the only black representative and in that capacity he introduced the first bill condemning lynching. He was attentive to local issues and appointed many blacks in his district to federal positions. Most noteworthy in White’s Congressional career was his farewell speech, in which he stated his belief that, referring to service by blacks in the national legislature, “Phoenix-like he will rise up some day and come again.” After completing his term in 1901, as the racial climate in the South was changing, White and his family moved to Washington, D.C., and later to Philadelphia, where he founded to first black-run bank. He established a black community in Cape May County, New Jersey, called Whitesboro. In 1879 George White married Fannie B. Randolph, who bore him a daughter. He married Nancy Scott in 1882, but she died within the year. In 1886 he married Cora Lena Cherry, daughter of a Tarboro politician. The couple had two children. White married one more time, to a much younger woman, Ellen Avant MacDonald, in 1915. George White died December 28, 1918, and is buried in Eden Cemetery in Philadelphia. A new building, designed perhaps by James Coor or William Nichols, was begun in 1806 and completed in 1810. The structure was seized and used as a Union hospital during the occupation of New Bern, 1862-1865. The academy ceased to exist with its incorporation into the New Bern city school system in 1899. However, the building was used by the public schools until 1972. Today it is administered by Tryon Palace and Gardens. The United States Coast Guard had its beginnings in 1790 as the United States Revenue Marine (the named was changed in 1863 to Revenue Cutter Service and in 1915 to Coast Guard). Alexander Hamilton, Treasury Secretary under Pres. George Washington, on April 23, 1790, proposed to Congress that a fleet of ten cutters be built and manned to counter the threat posed to the revenue by smuggling. One vessel was to be used in waters off North Carolina. The bill passed on August 4 and the following year the ships were built. Until the Navy Department was organized in 1798, the fleet constituted the only U.S. fighting force afloat. Working with Hamilton were John Daves, port collector at New Bern, and Nathan Keais, port collector at Washington, North Carolina. Correspondence indicates that, despite a shortage of materials and supplies, the ship Diligence sailed to New Bern in February 1792 where it was fitted out and commissioned in late June or early July. In command was Capt. William Cooke, whose appointment by George Washington was issued in April 25, 1791, during the president’s southern tour. The USRC Diligence was transferred to Wilmington in October 1792 where it was in service until 1798. In 1793 Captain Cooke and his crew charged François Henri Hervieux of the le Vainqueur de la Bastille with a breach of revenue laws and seized their cargo of $40,000 in gold. The Diligence was replaced by another ship bearing the same name in 1798. In November of that year the first revenue cutter stationed in North Carolina waters was auctioned off for $310. Graham A. Barden rose to power in Congress at a time when Tar Heels chaired several of the most important committees. In his thirteen terms conservative Democrat Barden used his influence to bring military bases to North Carolina while gaining a reputation nationally for his opposition to labor unions. Born in Sampson County and raised in Burgaw, “Hap” Barden attended the University of North Carolina where he played football. He served in the Navy in World War I and taught school in New Bern before setting up a law practice. He served as a county judge before his election to the State House in 1933. In 1934 he was elected to Congress to represent the Third District. Ways and Means Chairman Robert L. Doughton, a Tar Heel, in 1937 secured for Barden a seat on the Education Committee, which he chaired from 1943-47. Democrats lost the House in 1946 but Barden regained chairmanship of the renamed Education and Labor Committee that he held, 1949-53 and 1955-61. Barden was instrumental in passage of Section 14(b) of the Taft-Hartley Act, allowing states to enact right-to-work laws. He took pride in the Barden-LaFollette Act, providing funds for the handicapped, and George-Barden Act, funding vocational education. In 1950 he gained the national spotlight when he was denounced by Cardinal Spellman for sponsoring legislation to aid public schools but denying funds to parochial and private schools. Eleanor Roosevelt came to his defense. At home Barden is best remembered for his successful efforts to bring Camp Lejeune, Cherry Point Marine Corps Air Station, and Camp Davis to his district at the outset of WWII and his success in reopening Seymour Johnson AFB in 1952. Croatan National Forest was created during his tenure. Declining health led him to retire in 1961. Adam Clayton Powell was his successor as chair of Education & Labor. Barden is buried in New Bern’s Cedar Grove Cemetery. Campbell University established a professorship in his name in 1968. In 1795, Methodists purchased a lot at the corner of Hancock Street and Pleasant Alley (later Church Alley) in New Bern. Seven years later they completed construction of Andrew’s Chapel, the second church in the town. From its inception, the church provided segregated worship space for free blacks and some slaves. Between 1839 and 1843, white members left to establish what would become Centenary United Methodist Church, and the chapel became entirely African American. After the Union occupation of New Bern in 1862, Federal soldiers stationed in the town opened a school in the chapel. Nearly thirty soldiers of the 25th Massachusetts operated an academy for black children within the church until stopped by an order from provisional military Governor Edward Stanly who instructed that, since North Carolina law prohibited the education of slaves, the practice must stop. In late 1863, James Walker Hood, an African Methodist Episcopal Zion (AMEZ) missionary, was dispatched from New England to eastern North Carolina, charged with bringing local freed slaves to the AMEZ faith. Bishop Christopher Rush, head of the AMEZ church, had lived in New Bern as a young man and attended Andrew’s Chapel. Therefore, Hood was instructed to pay particular attention to the Andrew’s congregation. Arriving in January 1864, Hood convinced the congregations of both Andrew’s Chapel in New Bern and Purvis Chapel in Beaufort to join the AMEZ church. Although Andrew’s Chapel members apparently voiced their approval of joining the church first, Hood was prevented from officially accepting them because of a smallpox epidemic raging in the city. Officially, Purvis entered prior to Andrew’s Chapel. However, Andrew’s traditionally is viewed as the mother church of all AMEZ churches in the southern United States. The church played an important role during Reconstruction, serving as a spiritual and religious center for the area’s black population. In 1879 the congregation purchased a new church site along Queen and Johnson Streets in New Bern and built a new sanctuary. They also changed the name to St. Peter’s African Methodist Episcopal Zion Church. Following King Solomon Lodge were Giblem Lodge in Wilmington, Eureka Lodge in Fayetteville, and Widow Son Lodge in Raleigh. The African American Masonic lodges operated under the auspices of the Grand Lodge of Ohio until March 1, 1870, when a convention was held at the Giblem Lodge in Wilmington to organize the Grand Lodge of Free and Accepted Masons for the State of North Carolina (Prince Hall). Bishop James Walker Hood was made the first Grand Master of the state. King Solomon Lodge served as a foundation for black leaders in the community and state. It offered a network of communication, support, and fellowship and elevated members to political prominence. Members of the New Bern lodge included James O’Hara, legislator and Congressman; Henry P. Cheatham, Congressman; and George H. White, legislator and Congressman. The King Solomon Lodge building was erected in 1870 on Queen Street. A grand ball was held on February 23, 1871, to celebrate the building’s opening. It was reported in a local paper that the event “was largely attended and was a very enjoyable affair.” In the 1920s the structure was moved a short distance to make room for the expanding Cedar Grove Cemetery. It now stands at 710 Howard Street in New Bern and retains some original features. King Solomon Lodge remains active and is significant to the Prince Hall Masons, and the African American community at large, as mother lodge in North Carolina. Samuel Cornell, a native New Yorker, moved to New Bern in 1754 and became a wealthy merchant. By the 1760s he had amassed a considerable fortune. Among his holdings were two plantations, one on the Neuse River and the other, formerly the property of Governor Arthur Dobbs, was on the Trent River. He lived with his family in a spacious town house in New Bern. To serve his mercantile operations, Cornell operated several warehouses, a retail store, and at least three sailing vessels. He also owned a rum distillery that was well-situated with brick buildings and copper stills. Cornell’s wealth is evident from documents related to the devastating hurricane that struck New Bern in 1769. His family narrowly escaped from their flooding home. Still, records indicate that the floor of the home caved in, that all of his furniture was either broken or washed away, and that among the items stored in basement that was flooded were two hundred hogsheads of molasses, eighty hogsheads or rum, and several pipes of wine. Likewise Cornell’s store was destroyed “with all the Goods and Money,” and one of his ships was washed over the marshes and into the woods. His losses alone were estimated at £5000, or approximately one-fourth of the total losses in New Bern. In 1769 and 1770, as one of the wealthiest and most influential men in the colony, Cornell loaned substantial amounts of money to the government, underwriting the construction of a new governor’s house in New Bern. That residence became known as Tryon Palace. Governor William Tryon referred to Cornell’s generosity in a 1770 letter to the Earl of Hillsborough. Tryon stated that Cornell was “about forty years of age, of a very genteel and public spirit” and “a merchant of the first credit and fortune in the province.” As such a fine and generous citizen, Cornell was recommended to fill a vacant slot on the Governor’s Council. An ardent supporter of the royal government, Cornell seized another opportunity in 1771 to lend cash to North Carolina. He provided “large sums of money” to finance a military expedition to put down the Regulator rebellion. In addition to his loan, Cornell also sold to the colony £483 in supplies for the troops. An active participant in the Battle of Alamance, the engagement that culminated the expedition, Cornell was wounded in the thigh. By 1775 Cornell feared that he would be asked to subsidize revolutionary activities, with the permission of Governor Josiah Martin, moved to New York. Hoping to keep his real and personal property in North Carolina from being confiscated by the government, Cornell sailed to New Bern in 1777. With the cooperation of Governor Richard Caswell, he was allowed into town under a flag of truce long enough to collect some of his goods and servants and to register deeds of gift transferring his North Carolina property to three of his daughters. His will, probated in 1781, specifically mentioned his holdings of proclamation money of North Carolina. The North Carolina government confiscated Cornell’s property despite his efforts and sold it shortly thereafter. In 1787 Elizabeth Cornell Bayard sued Spyers Singleton to recover the Cornell homeplace on lot 10 in New Bern. The case, known as Bayard v. Singleton, set the American precedent for judicial review, and is considered milestone in legal history. Cornell’s bundles of proclamation money, mentioned in his will, apparently remained in the family until 1913 when they were offered, along with papers relating to the litigation over the confiscated property, to the New York Public Library. The papers were published that year as “Papers Relating to Samuel Cornell, North Carolina Loyalist.” In the 1970s the library sold the currency in its entirety to a dealer, who put half of the collection up for sale. The other half, representing about forty percent of Cornell’s original stockpile and the last remaining intact portion, is now part of the Colonial Williamsburg numismatic collection thanks to an anonymous donor. The Emancipation Proclamation authorized recruitment of black volunteers for Federal service beginning on January 1, 1863. Influenced by the success of the 54th Massachusetts, Massachusetts governor John Andrew and General Edward A. Wild saw potential for recruiting former slaves in occupied northeastern North Carolina. Since the beginning of New Bern’s occupation in March 1862, thousands of escaped slaves had poured behind the lines seeking freedom and aid. New Bern’s large black population and strong support for the Union made it an ideal location for a recruiting station. In May, Wild began recruiting for the First North Carolina Colored Volunteers (NCCV), placing the regiment under the command of James Beecher, half-brother of writer Harriet Beecher Stowe. He established the regiment’s campsite on the “south bank of the Neuse River just outside of New Bern,” and the first recruits went to work clearing land and setting up camp and a parade ground. By June 7, two of seven companies were in uniform and all had begun drill instruction. They were mustered in on June 30, 1863. White soldiers from the Forty-Fifth Massachusetts regiment aided in training. Although the top officers in the First NCCV were white, company commanders chose “promising” enlisted men to serve as sergeants and corporals. Upon the completion of training, the regiment joined others in forming Gen. Edward A. Wild’s “African Brigade.” During a farewell ceremony held at the Academy Green in New Bern on July 24, 1863, the “Colored Ladies Relief Association of New Bern” presented the regiment a silk flag. The regiment “would prove to be both brave and reliable in battle.” The regiment spent several months at Folly Island outside Charleston, where on February 8, 1864, Federal authorities redesignated it the Thirty-Fifth U. S. Colored Troops (USCT). The regiment soon deployed to Florida where it fought at the Battle of Olustee. One report stated “no regiment went into action more gallantly or did better execution” than the Thirty-Fifth. Though the battle was a Federal defeat, the regiment’s valor played an important role in changing white attitudes about the capabilities of black troops. Despite heavy losses, the Thirty-Fifth served for the duration of the war. As some of the first of thousands of southern black volunteers, including more than 5,000 from North Carolina, the First NCCV paved the way in demonstrating to the nation the importance of black soldiers to the Union’s preservation. The Croatan Earthwork, an extensive fortification not used during the battle, can be seen 6 3/10 miles southeast of this highway. Here, extensive earthworks can be seen on both sides of the highway in a direct line with this marker. Union: Major General Ambrose E. Burnside – commanding Division; Brigadier General John G. Parke’s Brigade; 4th and 5th R.I. Inf. ; 8th and 11th Conn. Inf. ; Brigadier General Jesse L. Reno’s Brigade; 21st Mass., 51st N.Y., 9th N.J., and 51st Pa. Inf. ; Brigadier General John G. Foster’s Brigade; 23rd 24th, 25th, and 27th Mass. and 10th Conn. Inf. If you are interested in other historical markers in the state of North Carolina or how to obtain an historical marker, click to the NC historical markers website. All of the historical marker information found on this page is courtesy of the North Carolina Department of Cultural Resources.